The wheeled, rounded-rectangular volumes of space enclosed by a metal shell and propelled by a small engine at one end or the other that we call a ‘minivans’ are some of my favorite vehicles ever. For whatever reason, a lot of companies like to claim to have the first of these: Chrysler likes to say so, as does Volkswagen. The truth, as usual, seems far more obscure. Chrysler’s claim is the easiest to refute, since their ‘minivan’ was introduced in the 1984 and it would take a 1984-level of history re-writing to make everyone forget about Volkswagen’s Microbus, which Chrysler PR people have tried to claim isn’t a minivan because it’s called a ‘bus.’ Nice try. While the VW Bus is easily the best-known and most popular of early minivans, there are some predecessors that beat its 1950 introduction date, like the DKW Schnellaster from 1949, the Citroën H-van from 1947, and possibly the Stout Scarab of 1935, though that wasn’t really designed to be a people hauler/commercial vehicle like a true minivan, so I’m not so sure I’d count that one. What I absolutely would count is the little machine that seems to have established the fundamental minivan (and mini truck) shape that Volkswagen later used, along with DKW, and then Chevy, Ford, Dodge, and anyone else who made small, forward-control vans shaped roughly like bread loaves. This vehicle, which first appeared in 1946, is the Chenard & Walcker CHV, sometimes called the Chenard & Walcker 1500, after how many kilograms it could haul, not how many cc’s its engine displaced, which was far less, at 720cc of twin-cylinder, two-stroke power, making an earth-rending 26 horsepower. Chernard & Walcker was a French automaker, active between 1898 and 1946; after 1946 they shifted to focus on trucks and commercial vehicles (like our little CHV here), and were later bought out by Peugeot, who continued to produce the minivans under the names Peugeot D3 and D4. The Peugeot-badged vans, made up until 1965, had more power thanks to a four-banger 1200cc engine from the Peugeot 202 (later a 1468cc one). The bigger engines did require a slight redesign that forced the van to grow a little snout out front, earning it its ‘pig-snout’ nickname. 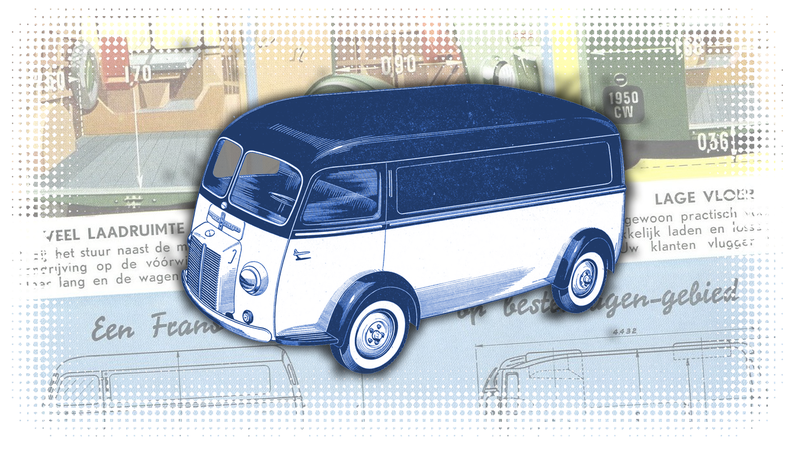 It’s the design of the CHV I really want to focus on today, because it’s remarkable how much their design sets the template that would follow for so many decades, and how much their van feels like a front-engined VW Type 2. The design seems to have been originally made as a French wartime ambulance prototype in 1940, amid the German invasion and considerable shortages of resources, which may account for the design’s brilliant simplicity and austerity. The basic design was set—engine between the driver and passenger, everything enclosed by a big box. There was no real attempt to ‘design’ or style the vehicle in any way, giving it an ideal form-follows-function elegance. The full-production version from 1946 smoothed out the sharp edges and refined the design a bit, but kept the basic, wildly rational packaging. Because of persistent fuel shortages from the war, there was even a remarkably modern-seeming electric version in 1947, converted by the firm SOVEL. It’s interesting to see how they came up with two battery-packaging solutions, too, one that retains a center ‘aisle’ and one that allows for a full-width, but shorter, load area. Pretty much anyone, even people who can’t tell a GT-R from a CR-V, can identify a VW Bus. It’s sort of a shame that the vehicle that seems to have been the first to really define this simple, iconic form is pretty much unknown, even to gearheads. I’m sure our European siblings are aware of the Peugeot versions, but even in its homeland I’m not sure if many are aware that this humble little workhorse pre-dates the famous VW Microbus, and that’s kind of a shame. The Chenard & Walcker CHV is an under-appreciated icon of automotive design, so let’s all just take a moment and raise a glass of something suitably French (champagne, French dressing, Citroën red fluid, whatever) to this stubby little workhorse.